MILKMAN: Milkman is a leading Indian electronic music event firm committed to high-quality curation, innovation, & more importantly giving music lovers a truly exceptional musical experience. Baba Stiltz, Interstellar Funk, Ben UFO, Bake, San Proper, David Vunk, DJ Stingray, Helena Hauff, Anthony Naples, Optimo, Pariah, Randomer are the recent India tours it has successfully organized. Sandunes is a keys player, composer and beatsmith. Hailing from Mumbai, her work has trodden a global footprint lately, seeing her open for Bonobo at Manchester International Festival, support George Fitzgerald's album release tour at Evolutionary Arts Hackney, perform at London’s Barbican Centre under a commission from Warp Records and Boiler Room, take in India’s celebrated Magnetic Fields festival and prestigious National Centre for Performing Arts, Mumbai, and tour the US supporting Pretty Lights. She has partnered with Red Bull TV for their global Searching For Sound series, cataloguing the rich sonic tapestry of Bombay, and guested as a speaker and lecturer at Ableton’s Loop Summit for Music Makers, Mumbai’s G5A, and Point Blank's production masterclasses. In 2017, she co-founded DASTA - a beatmaker’s collective that focuses on DIY growth and empowerment through the arts in India. Her work has been recognised by international and local tastemakers across various media including Rolling Stone, Red Bull Radio, Resident Advisor, Vh1, Red Bull Music Academy Daily, The Quietus, and The Guardian. 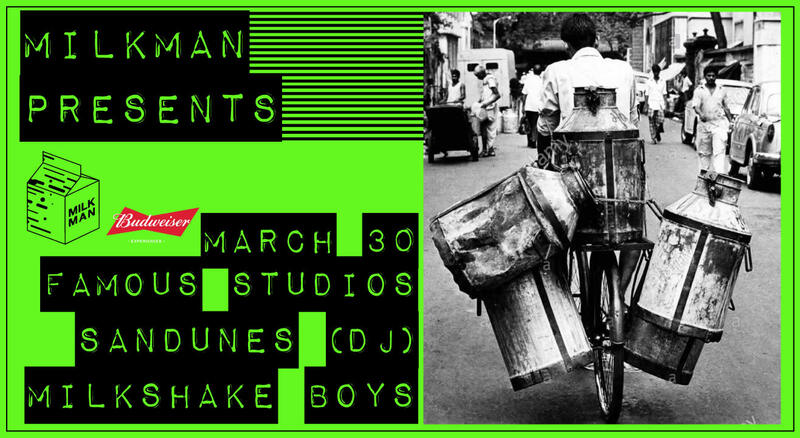 Milkshake boys consist of Milkman residents Spacejams and DJ:AI. Expect some electro, techno, disco, funk and everything else because there ain't no rules with the Milkshake crew.